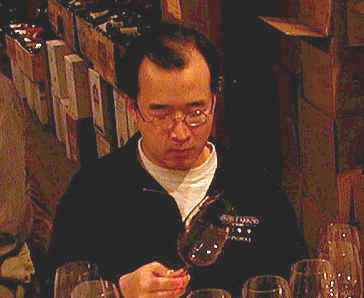 The praises of the 1997 vintage have been sung loudly by many of The Critics, comparing the wines to those of 1991 or 1994. Many wineries are delighted with the 1997 vintage as production levels were high, the media highly praised the vintage and price levels reached dizzying heights. The tasting featured wines from wineries which are often overlooked by critics and wine geeks as producing top quality wines. We hoped to uncover a gem, or two. Two wines were statistically well ahead of this class of wines. They finished six points apart, with 16 tasters voting. Third place through last were separated by a mere 16 points! 8th Place: WILLIAM HILL "Aura"
One person had this as their first choice, that taster having a preference for softer wines. Yet one critic described this as "acidic," while another pegged it as "Over-ripe, soft, tannic, bitter and having a mercaptan note in the nose and on the palate. It's ponderous, bitter and oaky." 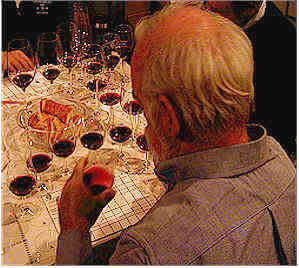 Someone else detected lots of "vanilla and oak, but over-ripe, tannic and hot with a bit of fruit." Another fellow found it to have a "hot streak of alcohol and meant for immediate drinking, not for cellaring." I found some pleasant cedary aromas and a touch of a berry note on the nose. It's tannic, ripe, woodsy and rather astringent on the palate. You need some patience for this and much hope that there's sufficient acidity to preserve the fruit. One star (three star scale, no stars being "average" or "standard"). 7th Place: VAN ASPEREN "Atlas Peak" "Krupp Vineyard"
One gentleman was so disturbed by the nose of this wine, he feared his stemware hadn't been properly rinsed and that the detergent left a perfumed residue on the glass. But others were disturbed by the fragrance of this wine, too. One person described it as "medicinal," while others found "green pepper" or "green herbal notes." Someone else found a "skunky" note, while another taster said this "is sour, bitter and oxidized." I couldn't decide if it was oxidation or volatility detracting from the nose, which I described as herbal. There is a fair bit of tannin and not nearly enough fruit to match, so I wouldn't recommend betting on this horse! 6th Place: SILVERADO VINEYARDS "Stags Leap District"
One critic described this as "funky, with a nasty herb character and a note reminiscent of Thousand Year Old Eggs, a traditional part of a dim sum meal." A second taster felt it "had the most fruit and no vegetal notes." When questioned about this, he qualified the statement, saying "compared to the rest." Another person felt this had the greatest level of wood of this set of wines. Someone else found "tutti-frutti" notes and wrote this off as "not being a blockbuster." I found the nose quite attractive, the wine showing oaky, woodsy notes with lots of cedary elements. The wine is medium-full-bodied and mildly tannic with plenty of nice wood to go along with the mild fruit intensity. I gave it a two star rating, feeling it might last nicely for another 5-10 years. 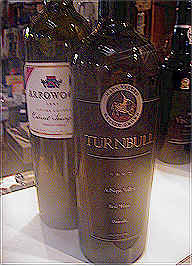 One vocal critic opined "If Larry Turley made Cabernet, this is what it would taste like! It's ripe, has lots of glycerin and not overly tannic, with lots of berries and a jammy note. It doesn't taste like a Cabernet, though." Someone else felt this has a short finish, while another person found "chocolate" notes. Another pegged it as being "Port-like." Another taster found rich, ripe dusty tannins and lots of alcohol. I found some cassis and ripe berry, veering off toward a ripe plum fragrance with a bit of oak. It's a soft, supple, very gentle style of Cabernet. Cellaring is probably not warranted, but then neither is the high price, for that matter. 4th Place: CLOS DU VAL "Reserve"
"Tannic, tannic and tannic" were the adjectives pasted on this entry by the first taster. Someone else echoed this sentiment, describing the wine as "chalky." Another found "dusty, piney, woodsy notes with a coarse, hot, bitter finish. It has nice, sweet oak, though." One person described the fragrance as being reminiscent of "coffee grounds, vanilla and oak, but I don't like this on the palate, but I liked the nose." I found some cassis and berry fruit with a hint of an herbal note, but was disturbed by an earthy quality which was simply dirty or reminiscent of potting soil. There's a fair bit of tannin and lots of the earthy, forest floor character in the mouth, so I'd suggest leaving this on the shelf. One lady described it as being "low in acidity, full, flat, flabby with hints of tamarind and orange rind, but with excessively bitter tannins." Someone else said they "liked the nose with its vanillin and oak and red fruit elements...raspberry and cherry." I found the nose to be exceptional, the wine showing vanillin and nice oak, with deep, rich fruit and a hint of tobacco. The same features appear on the palate, the wine being a classically-styled Californian Cabernet. It ought to last nicely for 5, 10 or 15 years. Two stars in my book! 2nd Place: ARROWOOD "Rserve Spciale"
"Big, dense and firmly tannic" were the words of the first person to lead the discussion here. Another found it "thick and syrupy, with good complexity and a 'mountain-grown' fruit character." 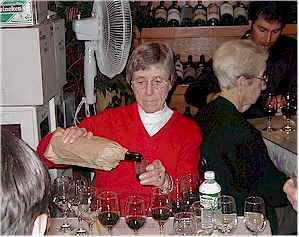 One lady found "sweet oak, black and red licorice notes with a hint of cinnamon and nice, sweet oak." Someone else said it's "quite tannic, but it has what it takes to go with those tannins." Another pegged it as "California-styled cabernet...big and oaky." I liked the woodsy notes, with good oak, some dark fruit and cassis elements and a touch of a violet fragrance. The wine shows the same elements on the palate and this wine certainly shows a streak of tannin. But it offers lots of complexity and nice fruit, so it has a good chance of aging gracefully. One-and-a-half to two stars. I don't think anyone would have predicted this wine winning the tasting! "Medium bodied, with supple tannins." were the notations of the first critic. A second taster felt it is "the most elegant wine, with ripe berries, red licorice and nice intensity of fruit...plus the tannins are under control!" Another participant noted "all the features are well-married and you can drink this now, if you like, but it has a long future, too." Someone else enjoyed this for it's "full body and sweet, ripe fruit characters." I found lots of cassis, berry and other dark fruit notes here. The wine also displays plenty of oak and is quite attractive on the nose. These elements don't quite weigh in with the same intensity on the palate, but that's nit-picking. The oak dominates, a bit, on the palate, but it's still a really nice wine. Eight to 15 years of cellaring potential here. Two stars +.